Sepp Blatter is resigning -- or is he? Way back when in journalism school at Northwestern, they taught us to be entirely skeptical about a great many things. The lesson they taught us in Evanston went like this: if your mother says she loves you, check it out. This maxim comes to mind now in assessing the state of soccer’s world governing body, FIFA, and in particular the status of its president, Sepp Blatter. Thousands upon thousands of words have been written since he purported earlier this month to be resigning. Yet among all those words, perhaps the most relevant seem to be missing amid that “resignation”: a resignation letter. It’s axiomatic that a genuine resignation leads to the execution of such a document. Has one surfaced? Or, perhaps, not really, not if you believe that Blatter never had any intention of resigning and, all along, his “resignation” has been the first step in an elaborate dance that he concocted to buy time. After all, he got 133 votes in that election on May 29.
Who then can really be surprised at reports this week that maybe, just maybe, Blatter might not really be out the door? To be clear, and for maximum emphasis: allegations of systemic corruption have shadowed FIFA for years, and now the time would seem to be upon it for change. But simply shouting, over and over, loud and louder, for Blatter’s head, is not necessarily in and of itself change. A journalistic mob brandishing the digital equivalent of pitchforks and torches is not helpful. It might feel swell to be part of the mob. But it’s empty. The serious questions that need to be asked are these: what kind of hard change needs to be effected, and who are the right people to effect that change? To make it easy, in the case of FIFA the relevant statutes at issue are Articles 22 to 24. Article 24 lays out who can be a candidate for president. Blatter knows this one well. Article 23 details the one-country, one-vote rule that is so essential to the 209-member FIFA system, and that assuredly has to be a focus of the moment for reformers and conservatives alike. It’s already common knowledge in international sport circles that Michel Platini, the UEFA president, met last week in Lausanne, Switzerland, the International Olympic Committee's base, with Kuwait’s Sheikh Ahmad al-Fahad al-Sabah, the president of the Assn. of National Olympic Committees and, as well, a new member of FIFA’s executive committee, which in soccer circles is commonly called the ExCo. All anyone had to do was be at the plaza bar at the Beau Rivage hotel to see what was what. Platini’s name keeps getting floated as a Blatter successor, as if Europe is somehow entitled to get its way next, again, after 17 years of the Swiss Blatter. The sheikh, meanwhile, who has a way of making things happen in whatever arena he plays in, has been mentioned as a potential successor as well, even though he is likely far more interested in ANOC, and in particular the promise of a Beach Games project. At any rate, for Blatter’s purposes going forward, it is Article 22 that is most essential. In theory, that would be as a predicate to revisiting Article 24. The issue is, how does Article 22 relate in practice to Article 24? Because it would appear there's a serious disconnect. Recall that on June 2, when he said he was resigning, Blatter said he was calling for an extraordinary congress. Or, maybe, he was calling on the ExCo to set up such a congress. The distinction is rather important. According to multiple reports, including the BBC, FIFA appears inclined to schedule the extraordinary congress for Dec. 16 in Zurich. An ExCo meeting, at which the date of the congress would obviously be high on the agenda, is set for July 20. But not at the president’s request. One-fifth of 209 is 41.8. Thus 41 or 42 nations, depending on whether you’re rounding up or down, have to ask — in writing — for an extraordinary congress. In an era of purported transparency and ferocious interest in its business, doesn’t FIFA owe it to the world to make public the list of the nations requesting this extraordinary congress? The ExCo meeting is scheduled for July 20. Three months past July takes the calendar to, at the latest, October. Dec. 16? When the rules clearly say three months max after, in this instance, July 20? There’s going to be a fall guy, for sure, and despite the rush to judgment in the mainstream press — in the United States, in Latin America and in western Europe — who is to say it’s going to be Blatter? As for Blatter himself being a “focus” of the Justice Department case: Blatter presumably learned after the ISL mess some years ago not to leave his fingerprints on anything substantive. Any evidence that Chuck Blazer might have to offer might well have to be submitted by deposition because by the time these cases make it to trial Mr. Blazer might or might not still be with us on this earthly coil. Feel free to ask a more experienced lawyer than me whether such evidence is in the first instance admissible in federal court or, next, liable to amount to a winning strategy. As for Jack Warner — again, ask a more experienced lawyer whether he or she would relish the opportunity to cut Mr. Warner up on cross-examination. The very first item would be Mr. Warner’s video brandishing The Onion, the satirical newspaper, and let’s take it from there. If one reads the FIFA website carefully, one would have noted on June 4, just two days after his “resignation,” a release touted Blatter’s proclamation that meaningful reform was already underway. So, again, why Dec. 16? Recall that the Swiss authorities have launched their own investigation into FIFA’s affairs. In these sorts of things, June to December can be a long, long time. What if, say, by December, that Swiss inquiry turns up nothing of significance? You don’t think so? The European legal system can be very different than the American. The U.S. system, for instance, is premised on plea-bargaining, and such deals are typically used to pressure those caught in the system to sing in an effort to nail those higher up; it often doesn’t work that way in Europe, where singing is thought to be a means of inventing. Also, the emphasis in Europe is typically in “keeping your collective nose out of other nations’ legal affairs,” according to a quote to be found in no less than the Economist, which assuredly has been zealous in its anti-Blatter reporting. If Blatter gets a free pass or its equivalent from the Swiss inquiry, he would then be able to appear before the extraordinary congress and say, 133 of you voted for me in the spring — would you like me to continue my mandate? Who’s to say the members wouldn’t — in December, just nine days before Christmas — be feeling the holiday spirit? Really? Any more than winning re-election just days after the U.S. indictments themselves? Remember, some 15 years ago Juan Antonio Samaranch led the IOC through the Salt Lake City scandal. Don’t fall into the “Samaranch was a fascist loser” trap that is the trope among many on the outside looking in. Within the IOC, Samaranch was, and remains, revered. 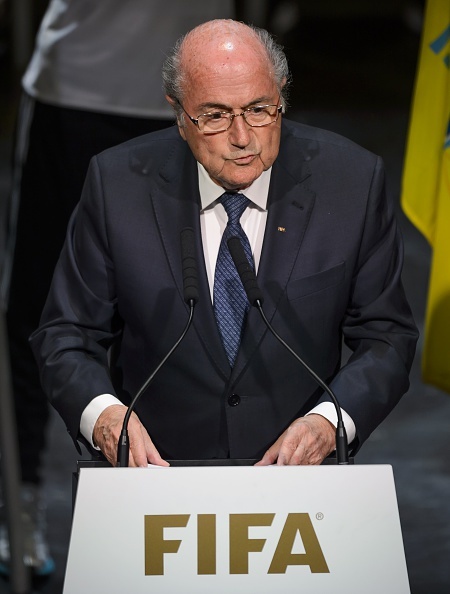 The issue is, how within FIFA is Blatter viewed? The answer is pretty obvious: 133 votes from the delegates. And that widely reported standing ovation from the staff. To those who insist soccer needs an outsider: recall the U.S. Olympic Committee’s experience roughly six years ago with Stephanie Streeter as chief executive. It simply did not work. She and it proved a bad fit, and anyone who would come in from outside to try to run FIFA almost surely would prove the same, and for the same reason — culture. You have to know soccer to run soccer. You can like it or not. But you can almost hear Blatter saying just that, can’t you? Of course, maybe FIFA is, actually, committed to fantastic reform. Back to the future: Sepp Blatter said June 2 he is resigning. Do you believe him? EUGENE, Oregon — You know who looks like geniuses right about now? Vin Lananna here at so-called TrackTown USA and Max Siegel, chief executive of USA Track & Field. They were two of the keys to bringing track and field’s world championships to Eugene in 2021. That might be the last hurrah. In the aftermath of the FIFA indictments, it likely may be a generation or more before the United States sees a World Cup played here, women’s or men’s. And the U.S. Olympic Committee’s 2024 bid, now centered on Boston? The International Olympic Committee won’t vote on 2024 until 2017 but this Boston bid can now be presumed to be DOA. U.S. and European mainstream news reports may be hailing the U.S. Justice Department’s decision to go after some of the sport’s heavyweights — the indictments, unsealed Wednesday, charge nine soccer officials and five marketing executives. Sepp Blatter, the head of FIFA, was not charged. In a statement Thursday before the vote Friday in Zurich at which he is widely expected to be re-elected to a fifth, four-year term, he said, “We, or I, cannot monitor everyone all of the time. If people want to do wrong, they will also try to hide it. But it must also fall to me to be responsible for the reputation of our entire organization, and to find a way to fix things. FIFA has ruled out a revote of the World Cup bids won by Russia for 2018 and Qatar for 2022. This is a highly charged game of international politics and intrigue where what the U.S. Justice Department does or doesn’t do, or says or doesn’t say, is hardly the final word. Indeed, it’s unclear how these indictments, or the prospect of further investigation or indictment, furthers any American criminal or international agenda. The United States is hardly a major soccer nation. Who in the United States was harmed by alleged wrongdoing or misconduct involving FIFA? If the government of some country — say, for hypothetical purposes, South Africa — pays someone a “bribe,” is that actually a crime? If so, why? What about the notion of sovereign immunity? What about this: is it illegal to take money from a government? Can’t the argument be made that this all rather smacks of politics and the generation of headlines — in particular for a brand-new attorney general, Loretta Lynch? Come on: this went down at the FIFA Congress? That wasn’t on purpose? Did anyone along the way — repeat, anyone — stop to consider or coordinate the multiple levels of U.S. policy internationally? To be clear: not to say that FIFA might not be exceedingly worthy of investigation or inquiry. To underscore: the amount of newsprint and digital pixelation that has been given over to allegations of wrongdoing or misconduct at FIFA over the years is monumental. But who decided that the United States of America ought to be the self-appointed problem solver, to ride in like the sheriff in an old western, and right whatever wrongs might be wrong in this particular soccer movie? Like, why? How’s that going for the United States in other areas of public policy — for instance, Iraq and Afghanistan? We don’t have enough issues back home, the federal budget isn’t strained enough, and this is the priority? Baltimore is melting down, Ferguson, too, and the Justice Department is chasing soccer balls in Zurich? If all this was the first step in a grand plot to take down Blatter, how long is that going to take? Long enough to play out through 2017, and the IOC process for voting for the 2024 Summer Games? Looking at that through an American prism -- if that's the case, is that a likely good thing for a U.S. Olympic bid? One, President Obama is known to have been exceedingly frustrated, or worse, after he made an in-person appeal in Copenhagen in 2009 at the IOC session on behalf of his own city, Chicago, and the members booted Chicago out in the first round of voting. Two, President Obama is the head of the executive branch of the American system. Three, the Justice Department is part of the executive branch. Draw whatever conclusions you wish. Again, it does not matter whether it is right or not, fair or unfair. What matters in the nuanced world of high-level international sport and politics is perception and relationships. Newspaper headlines can scream and blare and proclaim all they want. So when, for instance, Sunil Gulati of the U.S. Soccer Federation says Thursday that he intends to instruct the American delegate to vote Friday for Blatter’s challenger, Jordan’s Prince Ali bin al-Hussein of Jordan, where — afterward, and for a long time — can that expect to leave U.S. Soccer? The Russian president, Vladimir Putin, was — as usual — more forceful. So — if you are the USOC and you are weighing whether to keep up this charade of a Boston bid, with its dubiously low polling numbers and a plan that is not a plan, with leaders who were not even the leaders when the USOC picked it last January, now you’ve got Putin even more upset at the United States and Blatter, too. Ah, you say — Blatter is 79 and by IOC rules he has to go off at 80. But wait — under the new Agenda 2020 protocols, the IOC can grant waivers to five members to stay on past 80. So far, the IOC has awarded only one of the five, to the president of the skiing federation, Gian-Franco Kasper. That leaves four. Doesn’t it seem highly likely the president of almighty FIFA would get one of the remaining four? As for Putin — it is always worth remembering, as this space points out time and again, that the very first call IOC president Thomas Bach received upon his election in Buenos Aires in 2013 was from Putin. Russia has — for at least a few more months — four IOC members. Vitaly Smirnov is the dean of the members; he turned 80 in February. The chair of the 2022 evaluation commission is Russia’s Alexander Zhukov. Obviously, the 2014 Winter Games were in Russia, in Sochi. Given the country’s prominence in the Olympic movement, it would hardly be surprising if, by 2017, there were again four Russian members. Even at three, Russia holds considerable Olympic influence. Keep in mind that London beat Paris by four votes, 54-50, for the 2012 Summer Games — which means, really, by a swing of two votes. Blatter’s influence in the one-nation, one-vote FIFA system is in Asia, Africa and South America. As for the Europeans, who will be supporting Ali on Friday, come 2024, there figure to be at least three — Hamburg, Rome and Paris — and maybe four — Budapest — European cities in the Summer Games race. It’s in the IOC’s interest to have an American candidate, so be sure that the only thing you’ll hear from Lausanne, Switzerland, where the IOC is based, is how interesting and promising the American bid is, or could be. But let’s be real. This is a math problem. How does the USOC put together a winning coalition behind Boston? The Europeans have their interests. Putin and Blatter have long memories. One other piece to the dynamic. Sheikh Ahmad al-Fahad al-Sabah of Kuwait, one of the most influential figures in the Olympic movement, the head of the 205-member Assn. of National Olympic Committees, was just last month elected to the FIFA executive council. Long term: does the sheikh himself want to be the next FIFA president? The next IOC president? He’s only 51. Are his allegiances going to play more with Blatter? Bach? A question often asked: what does the sheikh want? In late October, ANOC is due to have a meeting in Washington, D.C. In the aftermath of the FIFA indictments, one now wonders just how many of the delegates are inclined to show up in Washington — or, perhaps, as October nears, to find a convenient excuse to kind-of sort-of you-know not show up, because showing up would give the FBI jurisdiction over their persons. Hey, everyone, let’s take a field trip to the FBI academy in Quantico, Virginia! Rendition — no, we don’t call it that! Not that anyone would be thinking anything like that — not after Chuck Blazer, once the top soccer official in the United States, identified as “co-conspirator #1” in paragraph 44 of the indictment, is said at the 2012 London Games to have secretly recorded former FIFA colleagues with a microphone hidden in the fob of his keychain. So let’s get this straight — the U.S. Department of Justice sought to use the former top U.S. Soccer official as a mole, as a rat, to gather evidence while at the IOC’s franchise, the Summer Games. Once that gets processed at the appropriate levels, that ought to go down just great for everyone in the United States in the Olympic scene for years and years to come. Who, now, is going to have a cup of coffee in the bar with an American and wonder if the feds aren’t listening? Blatter reportedly has not visited the U.S. in four years. Justice and truth, such as they are, are very fine things. Winning Olympic bids is quite another. No one is saying the USOC could have done anything to have stopped the Justice Department from doing its thing. But now the USOC has to live with the consequences. Spending $75 million, or more, in chase of something that is not attainable is not a good idea. That money is not the USOC’s money, nor is it the IOC’s money, but it’s still a lot of money, and at the end this all comes down to relationships, perception — and math. The USOC meets in late June in the Bay Area to consider what it ought to do next. There's a football model in the US -- now, soccer? OK, soccer freaks. Now that the 2014 FIFA World Cup is over, it's back to reality. Like it or not, this is the fact: in the United States, football, Peyton Manning-style, is king. A release issued Wednesday from the National Football Foundation & College Hall of Fame underscores the truth, and shows just how far the United States has to go before it can truly compete on the international stage with the likes of Germany, winners of soccer’s big prize. It’s not so much that the United States is bad in soccer. It’s not. It’s just that it’s not good — or, to be more precise, good enough.The difference is thoroughly evident in the way in the way the two countries approach their national sports. Seven new college football teams will take the field this upcoming season, according to the release, increasing the number of schools across all NCAA divisions and the NAIA offering football to 767, an all-time high. Welcome, Arizona Christian University (go Firestorm! ), The College of Idaho, George Fox University, Limestone College, Missouri Baptist University, Paine College and Southeastern University. For the geographically minded: George Fox is in Oregon, Limestone in South Carolina, Paine in Georgia, Southeastern — yes — in Florida. Since 1978, when the NCAA changed its method for keeping attendance, the number of schools playing NCAA football has gone from 484 to 657, or an average of 4.9 schools per year. That includes FBS, FCS, Division II and Division III. Over the years 2011-13, 25 programs have been added at NCAA or NAIA schools. The release quoted NFF chairman Archie Manning — the former NFL star who has had a second act as celebrity dad to both Peyton and younger brother Eli, both Super Bowl-winning quarterbacks — as saying that more than one million high school students play football, and that 70,000 play college ball. It's clear that in the United States young men see in football incredible opportunity, economic and otherwise. This is why in vast numbers they prefer football to soccer. To complete the syllogism, this is why soccer has such an uphill road in the United States. In the United States, football — starting in high school, perhaps even earlier — is a year-round venture, everything from seven-on-seven summer camps to “Friday Night Lights” and everything that goes with it to the big-time of playing college ball in front of 100,000 or more people. And then, of course, there’s the NFL. Football holds a special status in the United States. “It’s almost a religion here,” Paine athletics director Tim Duncan said in the NFF release, meaning in the South. How is soccer supposed to compete? How, too, is American soccer supposed to compete with what is going on in Germany — where a standardized nationalized program starts teaching the same skills to 6-year-olds everywhere, not just from Munich to Hamburg to Berlin but in every little village. By the time boys are 8, scouts are on the lookout for the ones good enough for club teams. The German program got started after a humiliating performance in the European 2000 championships. It took 14 years — yes, there was that 2006 World Cup semifinal — to ultimately prove itself. And now the system is in place for years to come. If you want to read all about the German program, the Guardian, the British newspaper, wrote an excellent feature in May, 2013, all about it. Without a similar transformation, the United States is, most experts agree, likely stuck where it is for years to come in international soccer. Such a transformation, however, is going to take time. That’s why Jürgen Klinsmann was brought on for more than just this 2014 World Cup and why he insisted he be named not just the U.S. coach but technical director. Consider the German team that won in Brazil: Thomas Müller, Mesut Özil, André Schürrle, Mario Götze (who scored the decisive goal against Argentina), and more — these guys are all in their young or mid-20s. And it has all been building, like a train coming down the tracks. You could see it in 2009, in Sweden, when the Germans beat England, 4-0, to win their first Euro under-21 championship, Özil setting up two goals and scoring another. Six of the players on that 2009 team played key roles in Brazil 2014. One of the players on that German team, Fabian Johnson, who has a German mother and an American father, switched to the United States in 2011; he played in all four games in Brazil for the United States. Much as Klinsmann might try, he can’t field an entire team made up of German-Americans. Long term, the only way the American team is going to get better is by doing it the American way — just the way the Germans got better by doing it the German way. It’s so obvious that in Europe there’s a club system and in the United States the focus has traditionally been the university. And yet men’s college soccer is at such a disadvantage when it comes to the big sell. If the game wants to get bigger in the United States, it has to take advantage of what it has. Currently, a men’s Division I soccer team is capped at 9.9 scholarships per school. Consider: Michigan had to spread those 9.9 scholarships around the 25 players on its 2013 roster. Stanford, 27. Consider further: Alabama doesn’t even field a men’s varsity soccer team. Each school, of course, had the maximum total of 85 football scholarships. If you are a young man with physical talent, and you want to go to a school like Michigan, Stanford or Alabama, and there are abundant reasons to consider any of the three, would you be more likely while in high school to lean toward soccer or football? Archie Manning notes that 70,000 young men play college football. The stats say 37,240 played college soccer in 2013. That’s a ratio of nearly 2 to 1. If you dig deeper, moreover, of the 37,240, only 5,691 played Division 1 soccer. The majority, 11,416, played at the Division III level. Meaning no disrespect to these young men, because they are out their training, sweating and giving of their time and commitment — but the issue here is not their dedication. That’s a given. The issue here is if and how the United States is ever going to be a world-class player like Germany. And it is not likely to get there with Division III talent. You want Americans to compete for real in soccer? Start with the 6-year-olds. Meanwhile, figure out how to fully fund soccer scholarships at the very best schools, and don’t get all hung up on Title IX issues, because if you really want to get good at soccer, this is going to take serious resource and the very best schools are where the very best talent goes. Then keep that talent here in MLS and pay them like honest professionals. Give the whole thing 10 to 15 years, like the Germans. Then you won’t have to depend on Tim Howard to make 16 saves, and his mother to say he should have made 17. Duncan, the Paine athletic director, said the school added 150 student-athletes in the year after it announced it was adding football, increasing enrollment by 11 percent at the historically black college. Already they have 28 football scholarships — above the conference average of 25. Easy math: that’s already roughly three times the number of soccer scholarships at a Division I school. That equals opportunity. Then there’s the University of Texas of the Permian Basin, in Odessa, home of “Friday Night Lights.” In the planning stages of adding football, the university must raise $9.5 million by the end of 2014, and appears to be on track. “We’re fully planning on being a successful football team,” university president W. David Watts said, the team intending to start playing in the 2016 season. This is it exactly. If there's $9.5 million for football in Odessa, and you want soccer to succeed in the United States for real -- this is how you make it happen. You have to step it up. In Odessa and everywhere. You make soccer the priority that football is. It's that simple. On Tuesday, Jimmy Graham of the New Orleans Saints signed a four-year, $40-million contract that makes him the highest-paid tight end in the NFL. Attention, soccer crazies: the United States is not, repeat not, a soccer nation. Or, as your all-knowing mother — and, for sure, mine — might have said: here today, Ghana tomorrow. Every four years, with the arrival of soccer’s World Cup, the opportunity presents itself to write a column like this. It’s difficult to know which is more fun. The column. Or the howling in response from the soccer crazies. Though I have lived in California for 31 years, I was born and raised in Dayton, Ohio. If I went back home to the central bus stop in Dayton, on Main between Third and Fourth, and asked the first 10 people I met who Landon Donovan is, odds are they would say, no idea. Maybe that guy from “Little House on the Prairie”? At the outset, to be clear: I actually like, really like, soccer. One of the perks of my job is that I have gotten to see games at some of the great temples of European soccer — San Siro, Allianz, Old Trafford, Emirates, Bernabéu, Camp Nou. Moreover, I was there at the David Beckham news conference in Carson, California, in 2007. And I would venture that Giovani Dos Santos’ goal, the dagger that gave Mexico its fourth goal in its 4-2 victory over the United States in the 2011 CONCACAF Gold Cup at the Rose Bowl, is still one of the great displays of soccer skill, anytime, anywhere. Of course, that most of the 93,420 people in the stands that day were rooting for Mexico — and that the American team had been up 2-0 and a real team at that level does not, can not blow a two-goal lead — emphatically prove my point. I do not, will not, dispute that over the next month thousands of Americans will crowd bars and sit in front of their living-room TVs to watch the goings-on from Brazil. That is not, however, because the United States is a soccer nation or even because the U.S. team has an odds-on chance of getting out of the Group of Death. It is because Americans love big events. The day the World Cup is over, soccer in the United States will go back to being what it is — background noise. I might wish it were different. But it’s not. For purposes of discussion, it is essentially 40 years, or two generations, since Pelé joined the New York Cosmos — it was June, 1975. That’s more than enough time for Americans to have learned how to watch the World Cup, if they were so inclined. Did the LA Times feel compelled to run a similar story before the Super Bowl — explaining, for instance, who the Denver Broncos or Seattle Seahawks were, and how a first down involves moving a football 10 yards or more on the ground or through the air? Obviously not. There’s no need to do so. Football is ingrained in American culture. Soccer is not. Throughout this column, by the way, I am going to be resolutely American and call it soccer. Not futbol or football, all pretentious-like, like this story in the New York Times that is a candidate for most over-the-top piece of journalism in recent memory. I have covered Rose Bowls, BCS championship games and Super Bowls. That is football. Later in this column I am going to return to football, and explain why football, Peyton Manning-style, is what Americans really care about. So soccer it is. Here, soccer nuts, is the crux of the problem: there are heavy economic, social, cultural and peer incentives working against soccer. Look at how many teams there are now in the MLS! Look at the new MLS TV deal! Look — the English Premier League is now on NBC! Currently, there are 19 MLS teams. (Up to 21 soon.) According to a November, 2013, story in Forbes, 10 are making a profit. Maybe I didn’t learn a lot in journalism school but if 10 are making money it seems pretty elemental that nine are not or are at best breaking even. If the financial play in the MLS is increased franchise valuation over time, fine. Good for the owners and their long-term investment plans. But to have the half the teams in the league flat or in the red — as Dean Wormer might have said in Animal House, that is no way to go through life. Since this is a World Cup year, you’d think that attendance at MLS games would be way up, right? Wrong. Eleven of the 19 teams are down. Overall, through June 2, attendance is down 1.86 percent from 2013. The new package, an eight-year deal with ESPN, Fox and Univision, is worth a worth a reported $90 million a year or, all in, $720 million. CBS Sports and Turner Sports are paying $10.8 billion for 14 years, 2011 through 2024, to show the NCAA men’s college basketball tournament. When you compare the soccer package with sports that matter in the United States, the conclusion is inescapable: soccer is, at best, a value proposition. And why is that? Because ratings for the MLS stink. Again, from Forbes: ESPN’s regular-season telecasts were down 29 percent, to an average of 220,000 per game, while NBC’s MLS audience fell 8 percent, to 112,000 per game — ranking the MLS behind the WNBA. So, the natural question: why are ESPN, Fox and Univision shelling out money? And why is NBC showing the Premier League? Disclaimer: I have had a relationship with NBC, on air and online, since 2003. But I have had no involvement, zero, with its soccer programming. The logical answer is that in an age of exploding channels, soccer games fill a lot of airtime. And there’s a niche that’s interested, especially in the Premier League. But that hardly makes the United States a soccer nation. Especially if what’s at issue is televising games from some other country. It’s so obvious that football is America’s game. The two most popular sports in the United States are the NFL and college football. When Ohio State and Michigan play football, they jam into the Shoe in Columbus or the Big House in Ann Arbor. The two schools played at Michigan in 2013, at Ohio State in 2012. Here are the attendance figures: 2013 in Ann Arbor, 113, 511. 2012 in Columbus, 105, 899. When the two schools play men’s soccer? Michigan played at Ohio State last Oct. 6. Attendance: 962, at 10,000-seat Jesse Owens Memorial Stadium. As they say, ladies and gentlemen, numbers do not lie. The numbers here say that soccer is roughly 1/100 as popular as football. That seems about right. The issues confronting soccer, as it relates to football, are both simple and complex. When boys who are talented athletes are roughly middle-school age, they self-select out of the AYSO leagues they have all been in since they were 5 or 6. Why? Because it becomes apparent that there is way more opportunity — of all sorts — in football than soccer. For one, there are more than 120 FBS football schools. Each of those schools offers 85 scholarships. This is simple math -- more than 10,000 scholarships. There's also the allure of playing on television every week. There simply aren’t that many soccer scholarships -- a fully financed Division I team can offer 9.9 full scholarships for freshman to seniors, and those scholarships can be divvied up among the team. In total there are 1,990 scholarships. That’s a powerful economic incentive right there in favor of football -- roughly a 10 to 1 scholarship-available ratio at the major-college level alone. Then there are the many social and cultural imperatives. At many if not most high schools, it is a tradition that the football players get to wear their jerseys to school on Fridays. It is a big deal on multiple levels to be school royalty — believe it. It has been a long time since I was in high school but this much has not changed: cheerleaders and the dance team tend to notice the football players. Do you think “Friday Night Lights” was all about … soccer? Right. If you are good enough to play college football, that is a calling-card that stays with you for life -- in business, wherever you go. That is America. This is not likely to change. Talk, too, all you want about concussions, and how a great fear of football is suddenly going to sweep the country and drive parents to move their boys to soccer. As if. Talk to soccer moms about concussions — you don’t think you can get hit playing high-level soccer? We haven’t even gotten yet to basketball. Suffice to say that there are basketball scholarships, too, and that basketball, college and the NBA, is way more popular than soccer. That’s why CBS and Turner are shelling out those billions for March Madness. It’s why — if I went to that bus stop in Dayton — you bet they’d know who LeBron is, and I wouldn’t have to volunteer a last name. There are all kinds of things wrong with baseball. Yet each year most Major League teams consistently draw millions of fans. The United States is not really a hockey nation, either. But on this subject it’s difficult. The Los Angeles Kings just won the Stanley Cup for the second time in three years. The Cup went back to the bar across the street from the house I lived in for 14 years. So I’m going to move along in this column. The two factors that can spark the changes that might — I say, might — make the United States a soccer nation are, one, a deep run in the World Cup, or, two, the MLS. 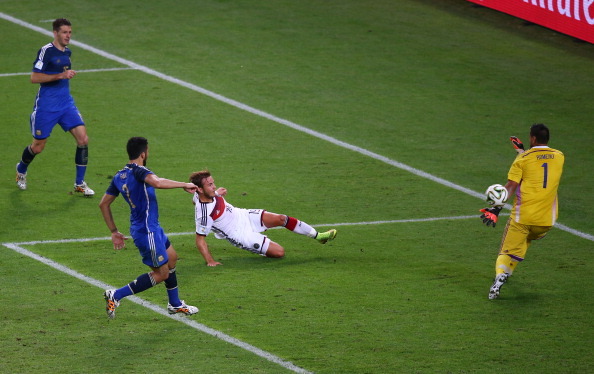 A deep 2014 World Cup run would be, in a word, unexpected. It would seem apparent that US Soccer head coach Jurgen Klinsmann, who dumped Donovan and is going with a younger team, is setting things up for a more sustained run in 2018 in Russia and hoping luck might turn the Americans’ way in Brazil. No argument here with that strategy. Of course it all starts Monday with Ghana — which has knocked the U.S. out of the past two World Cups, beating the Americans in the final group-stage game in 2006, defeating the Americans again in the round of 16 in 2010. Meanwhile, the MLS simply is not designed for that kind of far-reaching change. Structurally, everything is all wrong. US Soccer is in charge of soccer in the United States, not the MLS. Which is kind of weird — like USA Basketball telling the NBA how to run things. Which, when you think about it, raises a fundamental question: why is it that way in American soccer? While that gets sorted out, one of the best thing that could happen to the MLS — besides the obvious, more talented players — would be a sharp dose of the WAGs and drama that attend the Premier League. That would make soccer way more interesting. In the meantime, everyone, enjoy the World Cup. Don’t sleep on the Belgians. When it’s all over in Brazil, NFL training camps will commence. Thankfully. Richard Sherman, America awaits your next breath of fresh air.